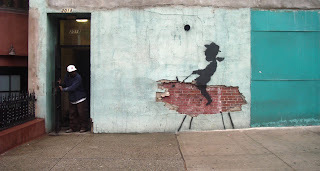 I chose this Banksy art this week because I love how he can make an old, run down wall look so awesome. For the body of the animal Banksy is using the cut out section of the wall that is exposing the brick. It also looks like the animal has an open mouth. Because of the pale white background that is the wall, Banksy decided to use the silhouette of a boy instead of a detailed painting. This makes the picture show better from a far distance, like all Banksy's work. He seems to like bold art that makes a statement instead of worrying about detail. Comparing both objects in this art, the boy seems to be more realistic than the animal he is riding. The animal only has the bold body of the brick and just straight lines for legs. The size of the man in the doorway is smaller than the boy in the art which makes the artwork very large and over scale. LOOOOOVE Banksy. I'd like you to backup a bit and start a discussion of an artist like Banksy with whom not everyone may be familiar by explaining a bit about what he does, his process and his work- then this piece is all the richer. After the first sentence you could say something about that it's a graffiti image on a wall depicting a man riding a beast, maybe a cow or a funny dog, that the mans is seen in silhouette and the beast's body is formed by brick exposed in a patch where the plaster of the wall has crumbled.